Moore testifying at the JDRF (Juvenile Diabetes Research Foundation) Children's Congress in 2009. 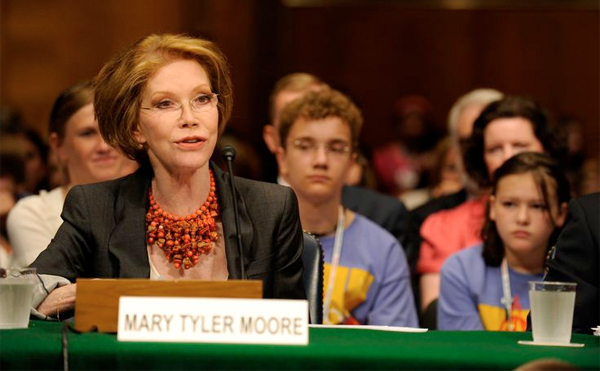 Actress and activist Mary Tyler Moore has died at age 80. The Hollywood Reporter has a nice obituary focused on her acting career. She was also an activist whose work centered on diabetes and animal rights. Ironically, Mary Tyler Moore was not a feminist herself, despite being a feminist icon to many women. But her starring turn on The Mary Tyler Moore Show was hugely influential for generations of women. When I arrived at university, walking across campus on my first day in Chicago, I remember feeling exhilarated and scared and full of gumption. I was wearing a green corduroy cap, which my mother had made for herself before I was born, and I took it off my head and threw it up in the air in celebration. Because a million rewatched episodes of The Mary Tyler Moore Show had suggested that was the only appropriate thing to do. My condolences to her family, friends, colleagues, and fans.